Due to rampant malnutrition, thousands of children suffer from stunted growth, disease and the ravages of neglect. While some children are able to remain with grandparents or other family members, that is not always ideal. Often these relatives neglect the children or use them as servants for the rest of the household. At times these abuses are so flagrant children are forced to flee. They have nowhere to go but into the streets where they often become thieves, prostitutes and drug addicts. Ultimately, many become infected with AIDS (HIV) … and the cycle of hopelessness continues. Uganda’s children are lost and dying! 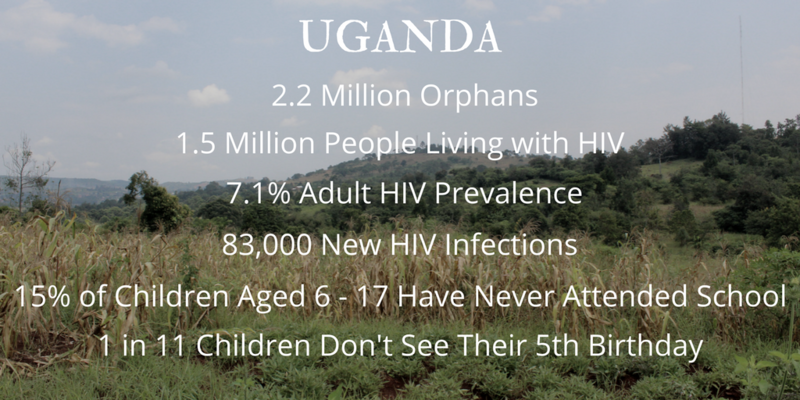 Currently, 7.2 percent of Uganda’s population is living with HIV. This amounts to an estimated 1.4 million people, which includes 190,000 children. An estimated 62,000 people died from AIDS in 2011 and 1.1 million children have been orphaned by Uganda's devastating epidemic. HIV prevalence has been rising since its lowest rate of 6.4 percent in 2006. New infections are diagnosed in 150,000 people a year, of whom 20,600 are children. Despite this, the 2012 life expectancy of 55 years is nine years higher than the expectancy in 2000, likely to be a result of greater access to treatment for people living with HIV. Uganda’s current population is about 32.7 million (last census 2010), with 50% being under the age of 14. The Sub-Saharan African nation has more than 2.3 million children orphaned due to AIDS-related deaths. With a total population of more than 30 million, Uganda has the highest proportion of AIDS orphans of any country in the world. Though Uganda now has a stable government, it is still crippled by debt, lack of industry, and the AIDS crisis. Therefore, the government is unable to support services to rescue its children. Churches and international relief agencies are vital to confront this crisis on a daily basis.